This week’s rain has confined me mostly to the greenhouse and polytunnel, both of which needed attention anyhow! Yesterday I cleared out the last of the mangetout plants (the outside ones are now cropping). 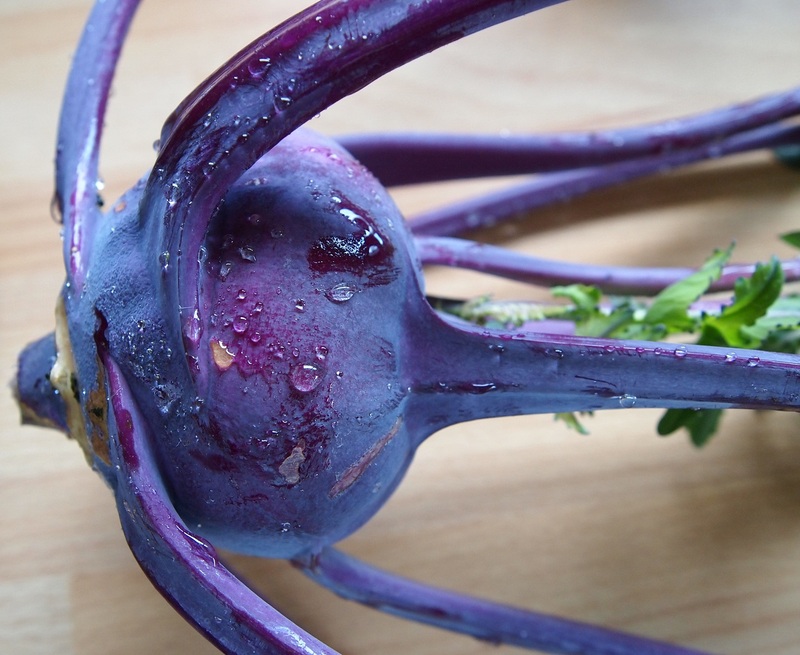 We’ve been enjoying the Charlotte potatoes, broad-beans and purple kohlrabi all from the tunnel. 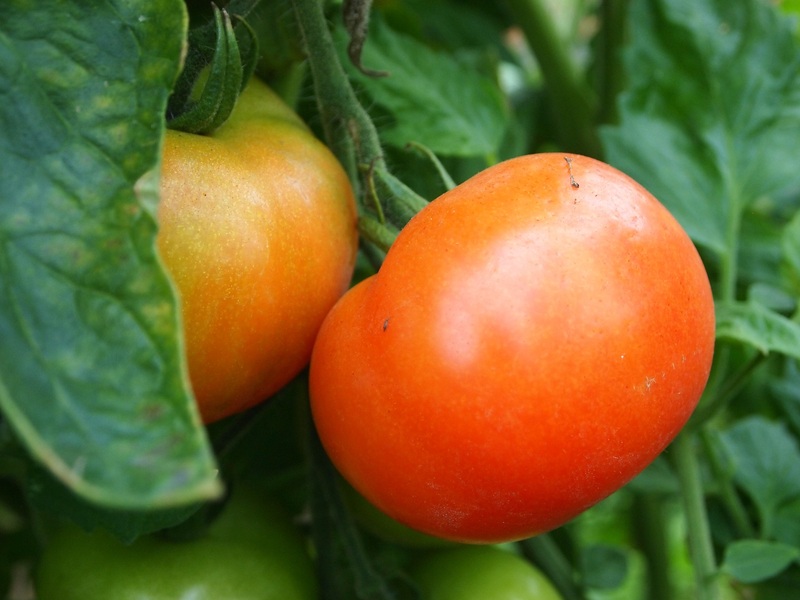 In the greenhouse, some of the tomato plants have set their first fruit and there are a couple of tiny cucumbers too, though the plants are still small. The purple dwarf beans have cropped quite well and the courgette plant is looking great. I need to take it out as it’s taking up too much room and I have more plants outside (looking very small and miserable) and one in the polytunnel. As it’s cropping very well I’m going to leave it as long as I can. So for now I’m removing some of the leaves. Today, it had stopped raining so I had a chance to do some weeding in the vegetable plot. I am leaving the strawberry bed (it’s full of weeds), as the damp weather has resulted in lots of slug damage and those the slugs aren’t eating the birds are. My plan for next year is to put the strawberries in pots in the blueberry fruit cage. Yes, we have some nice black and red currants ripening. 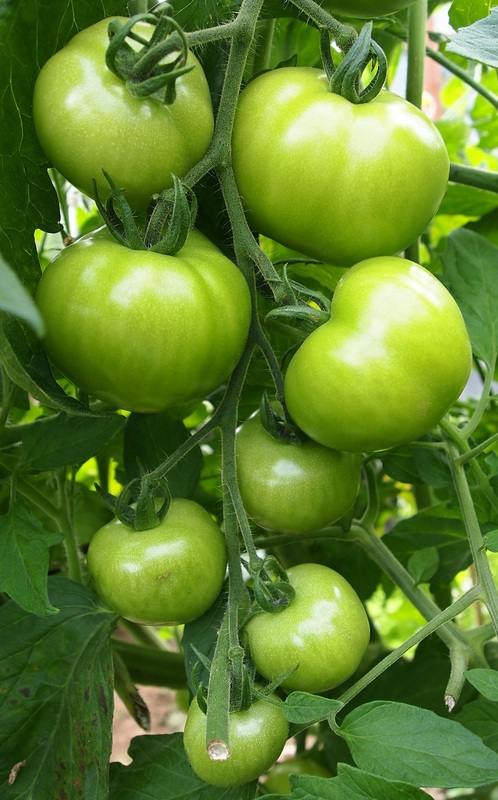 They are one of our most reliable fruits. The green bean like pods are actually the seed pods of some of my brassicas. I leave some plants to get seed for next year but the kids and I find them quite tasty too. 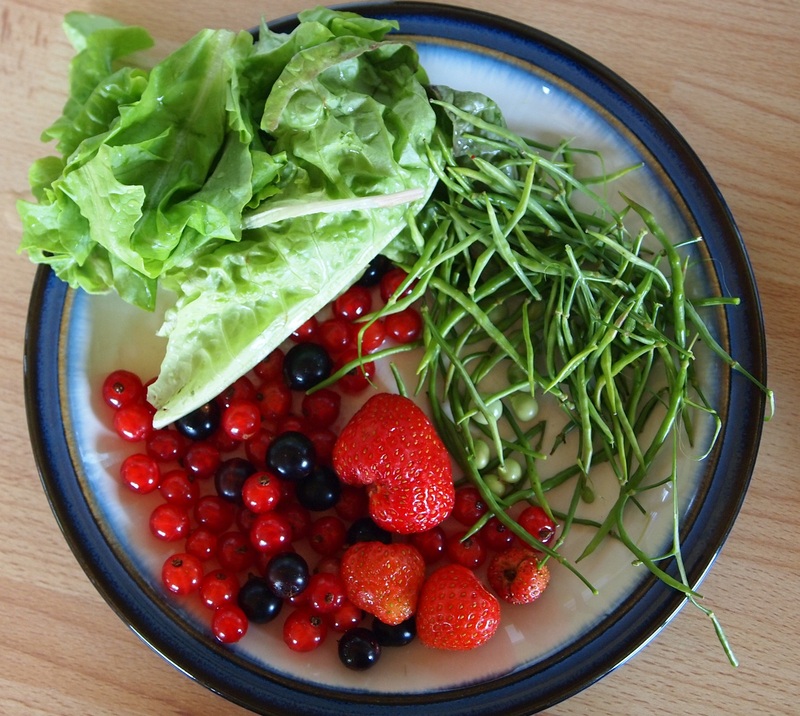 This entry was posted in Fruit, Garden, vegetables and tagged beans, Courgette, greenhouse, Kohlrabi, polytunnel, strawberries, tomatoes on July 8, 2015 by Murtagh's Meadow. Spring is definitely here though the weather is still cold and wet. But the flowers are opening and warming the heart. 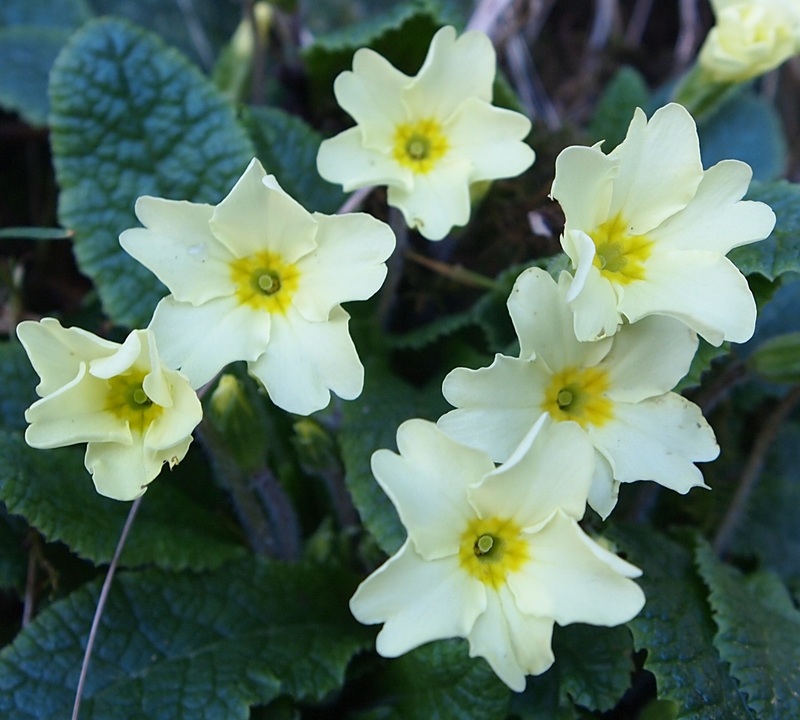 My favourites are primroses. They grow in the banks of our hedgerows. The first ones we saw were on the 14th February, but these were a bit battered by the hail showers we’ve been having. The ones below were photographed on the 19th February and are in a bank below some lovely old, wizened hawthorns on the edge of our hill field. 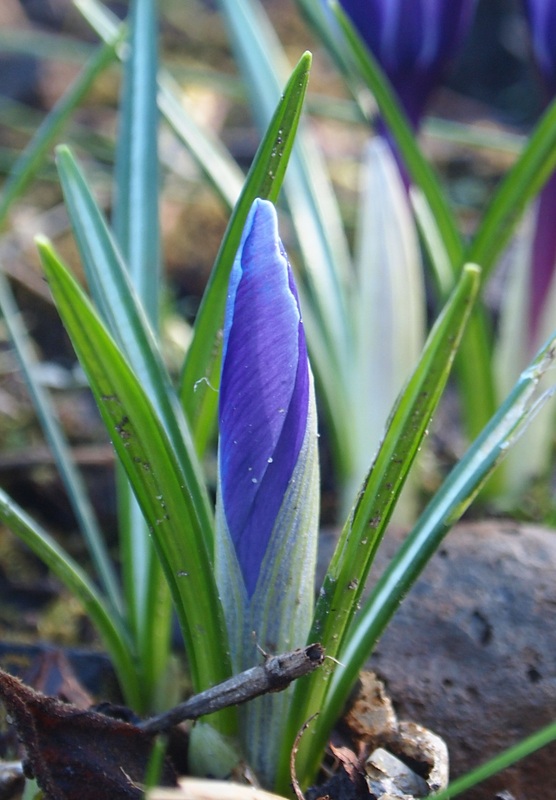 In the garden, the crocuses are opening and today our first daffodil opened fully. In the polytunnel, we have planted our early potato crop – the variety is Charlotte and we can usually harvest them in May. They will be small but delicious! The second lot of broad beans I sowed (the first ones were eaten by a mouse!) have germinate and are just starting to grow. I’ve leave them in pots for a couple of more weeks before planting into the tunnel. In the greenhouse, I’ve sown some radish and early lettuce, a few kohlrabi and early cabbages in seed trays. We’ll see how they all go. In the wood things are moving too. 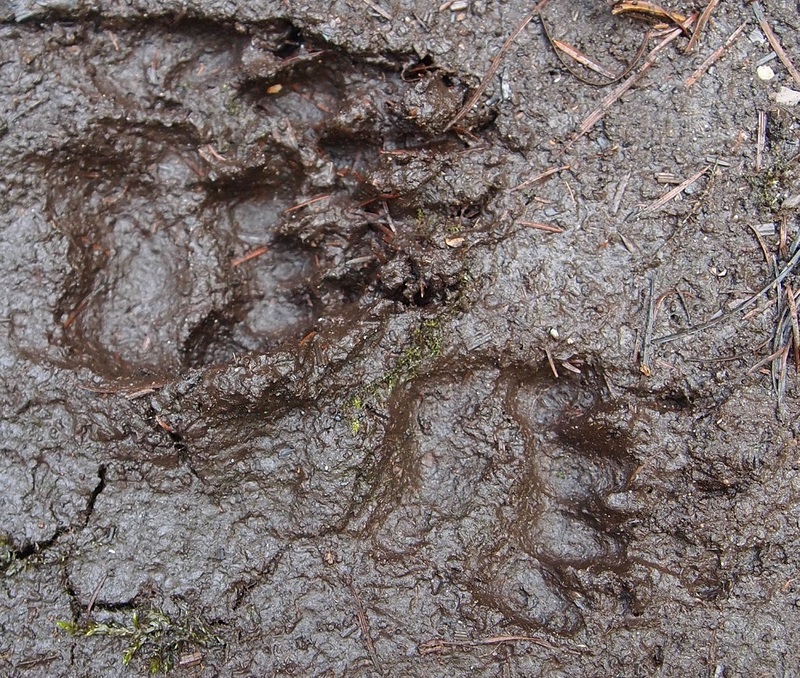 I spotted these badger prints a couple of weeks ago. Badgers don’t live in the wood but every so often we will find footprints on the muddy bits of the track, where they have been passing through. 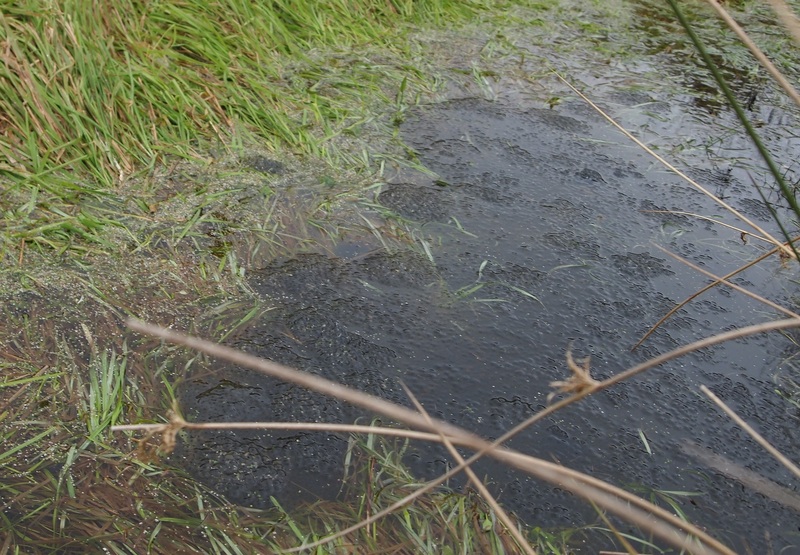 And a sure sign of spring – the frogs have returned to spawn in the drain below the chicken field. It is always the first place they spawn. They will return to the pond in the next few days. It will be interesting to see if they will use the new pond, which lies between the drain and the existing garden pond. The photo isn’t great. I haven’t been able to sneak up on the frogs yet – without them all diasppearing under the surface of the water – but the picture will give you an idea of the amout of spawn. Each clump of spawn represents what one female has produced. There are about 50 clumps – that is 50 female frogs. And for every female frog there will be a male mating with her – that is 100 frogs in this little bit of drain. It’s pretty impressive! This entry was posted in Garden, Nature, vegetables and tagged badger, frogs, garden, mammal, nature on February 26, 2015 by Murtagh's Meadow. Up to now we’ve had a pretty mild autumn so I think this is why things have done really well in the polytunnel. Growing greens outside, once autumn arrives, I find impossible in our damp climate as the slugs and snails soon demolish tender green leaves. But the polytunnel is great. The drier mirco-climate and small space which can be easily monitored, means few if any slugs. So things thrive. 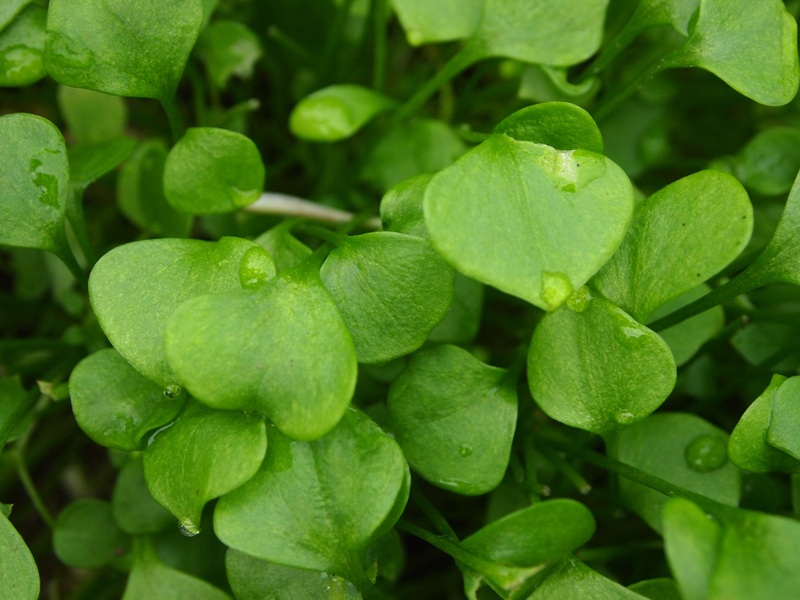 I may have made the mistake of letting last years winter purslane go to seed because it is now all over the polytunnel. Not that that is a problem really. It looks great and is very hardy. 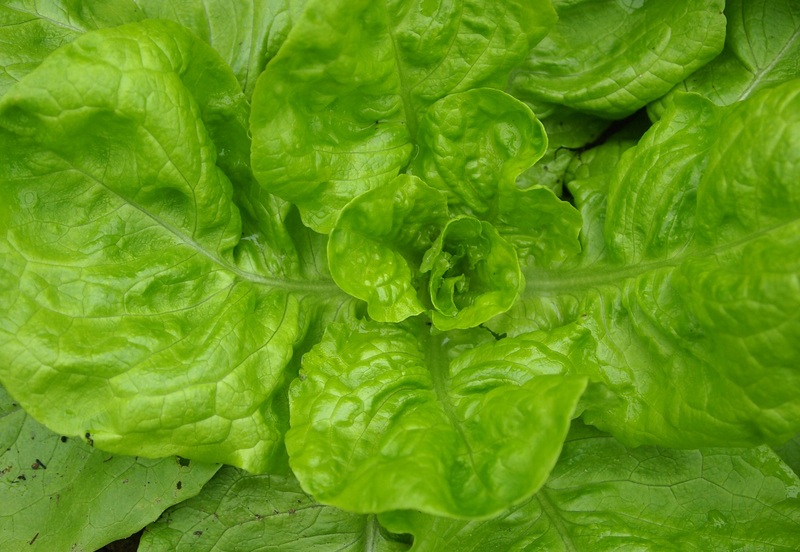 Together with rocket, lambs lettuce and mizuna, it makes a great lunch salad. There are some winter density semi-cos lettuce maturing in both the poly and greenhouse and it will be interesting to see how they progress. 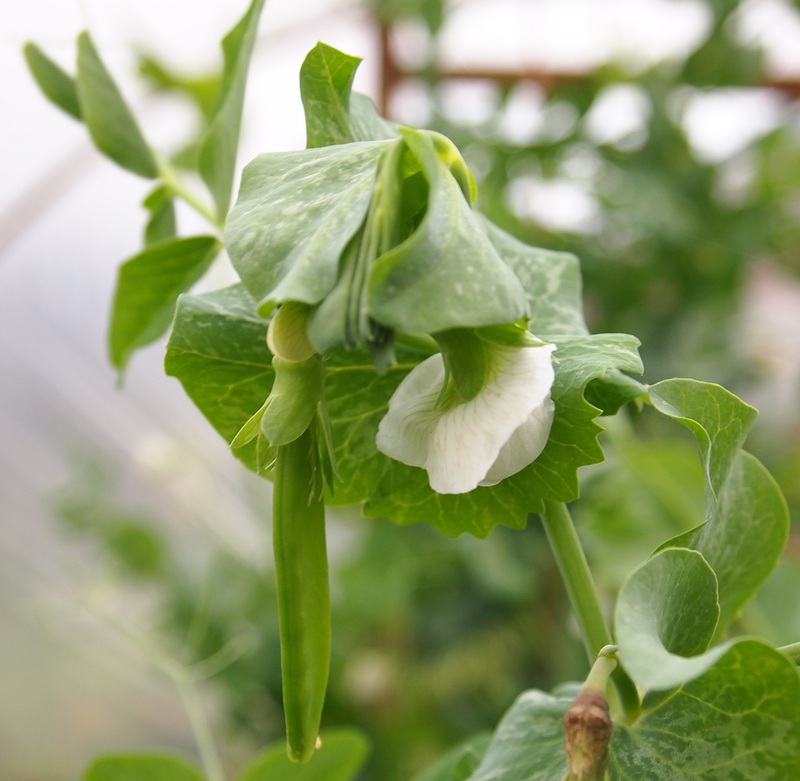 Yesterday, I harvested another meals-worth of mange tout peas. Though they are admittedly getting to the end, now that light levels and temperatures have dropped. Still who is going to complain about having fresh peas in November! In the greenhouse, there are still tomatoes going red too and some green ones that I really should find time to make chutney with. 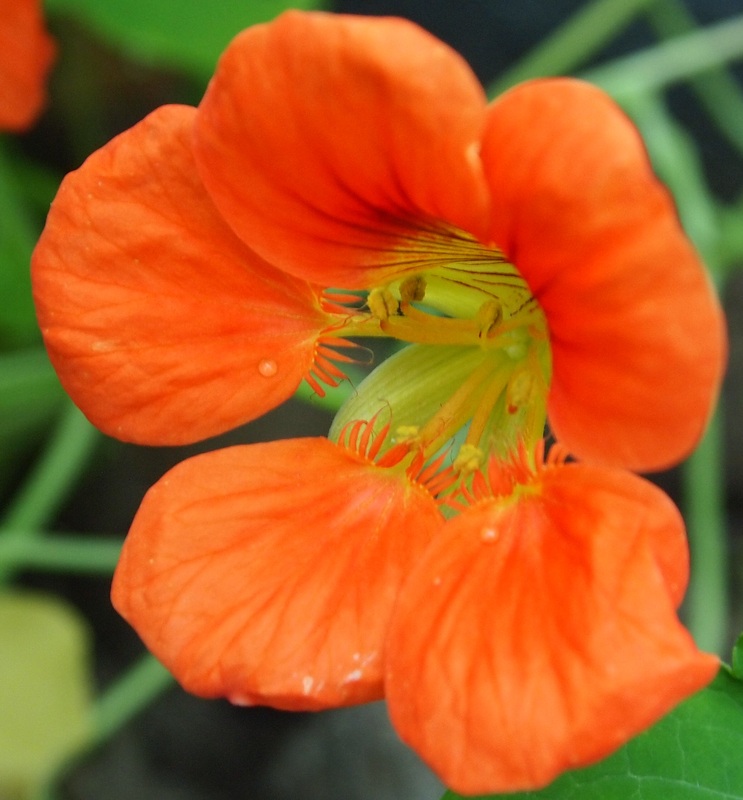 And finally some Nasturtium flowers to warm the heart. This entry was posted in vegetables and tagged greenhouse, polytunnel, winter greens on November 12, 2014 by Murtagh's Meadow. It’s been a wet week with plenty rain and little time to get outside with the camera as report writing is keeping me indoors. So I thought I’d reflect a little on the growing year. There is no doubt it has been the best one for years. 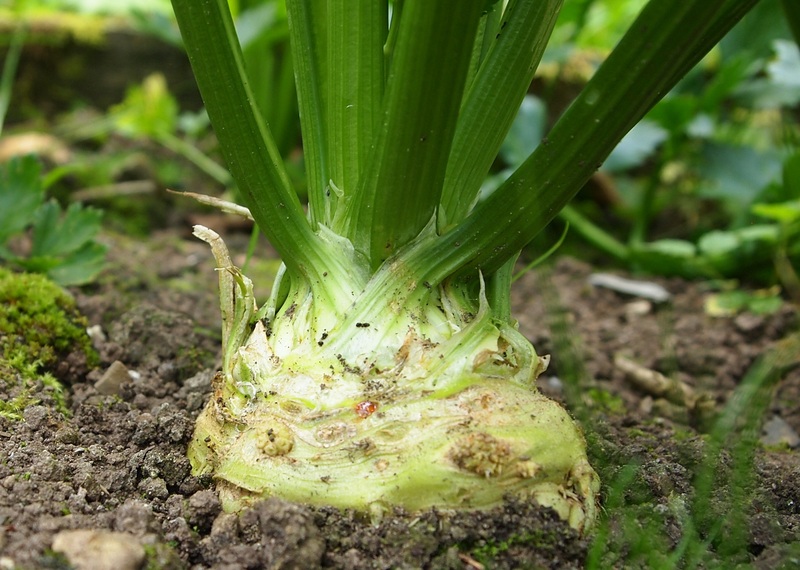 Despite late frosts in the spring it has been a long growing season and this has helped a number of winter vegetables including the celeriac. Some years this may only get to golf ball size for me but this year they are the size of a good fist, plenty to add to a soup or stew. 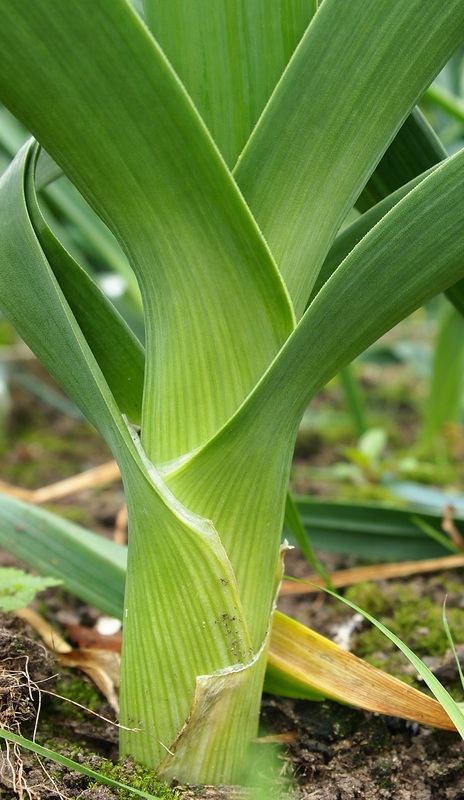 Leeks too have done well. I learned this year to give them an extra feed too, which has probably helped. I love this curly kale. Not only does it look great, it tastes good too. Despite a few caterpillar attacks and late sowing it is now doing really well and looking healthy. 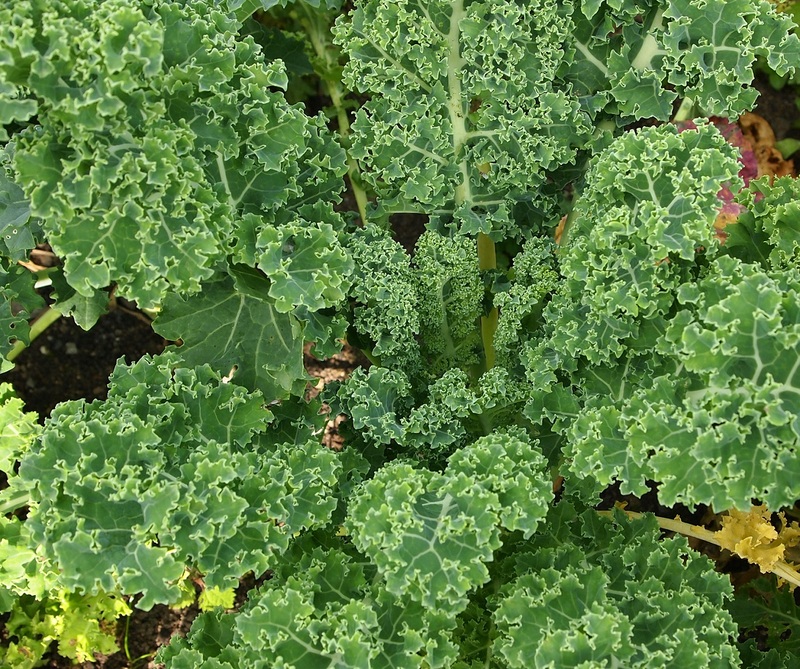 This entry was posted in Garden, vegetables and tagged celeriac, curly kale, leeks, vegetables on November 7, 2014 by Murtagh's Meadow. 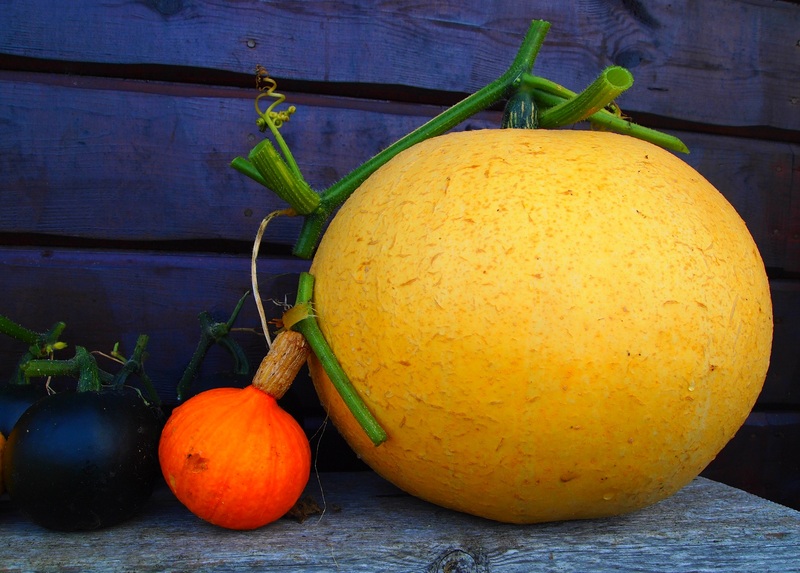 It has been a great year for squash in our garden and with the first frost the other night it was time to start harvesting. 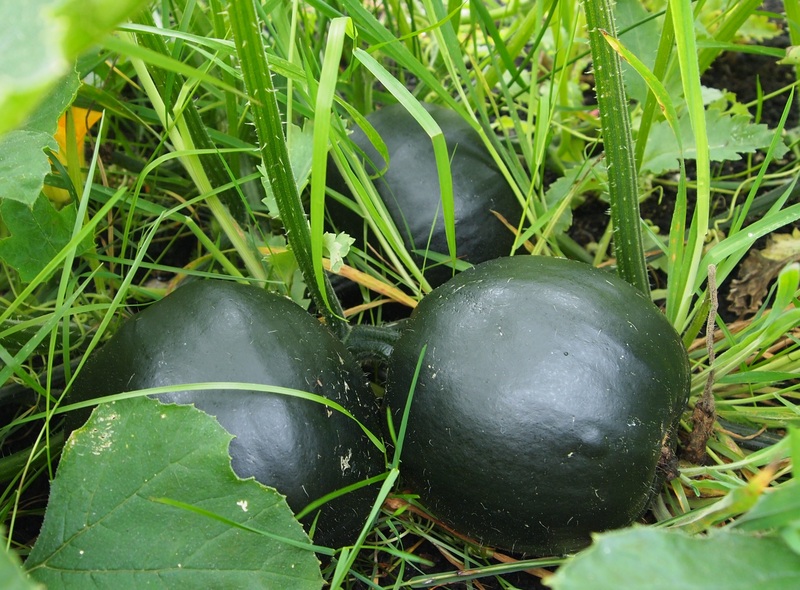 Last year, I discovered Little Gem squashes which have cropped very well for me again. But this year, I have also succeeded in growing Ushiki Kuri. 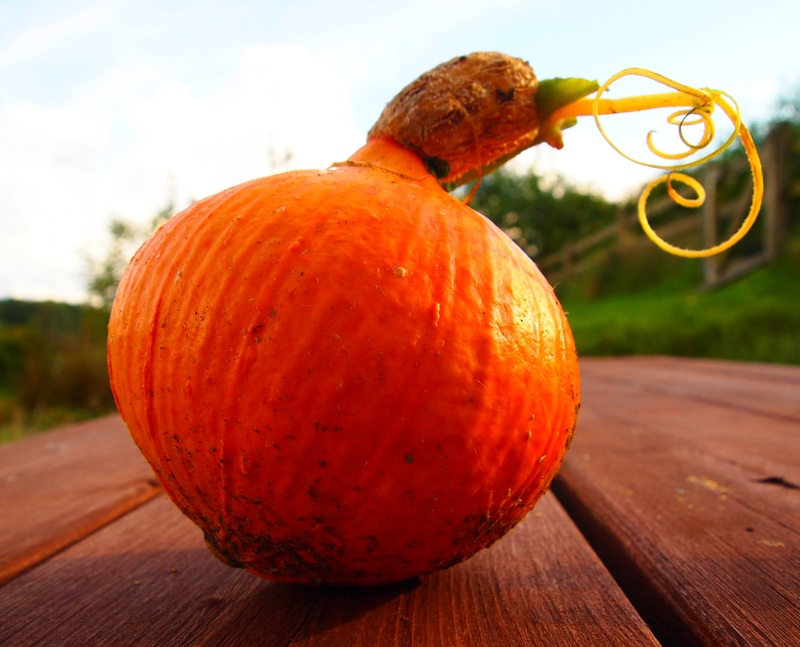 This is another small variety – about size of small grapefruit. 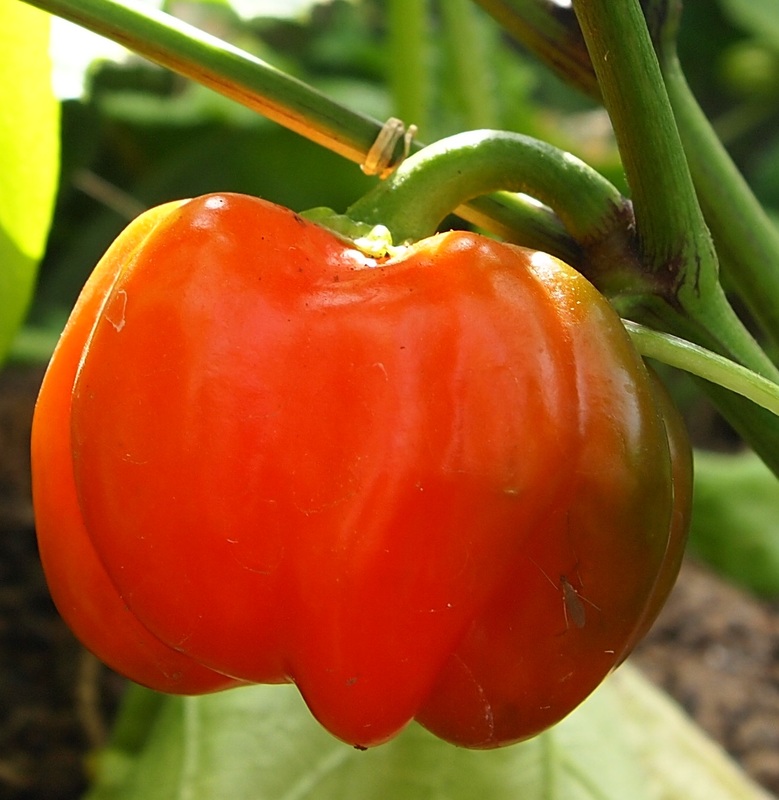 This variety didn’t do well last year – but I think our warm September has benefited them this time. I have harvested eight of them today. Also included in the photos are the little gem and a large yellow variety. 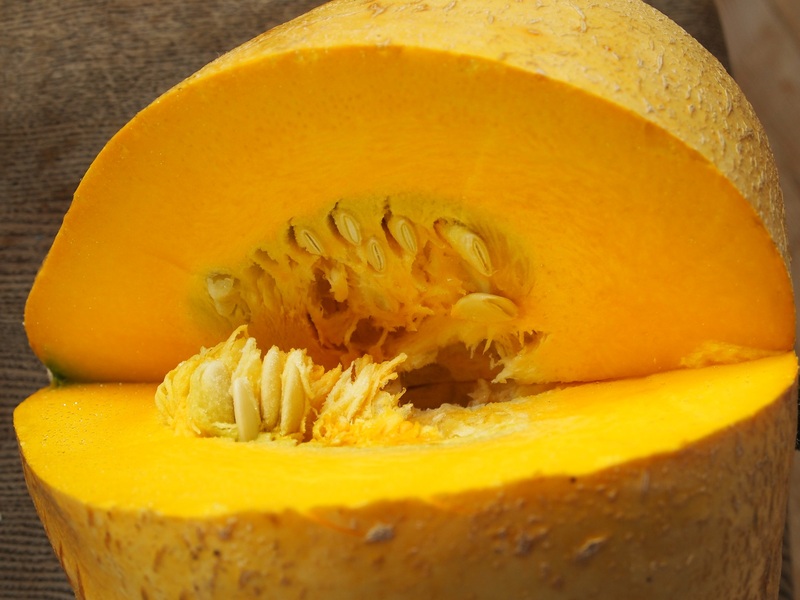 These large ones have soft flesh much like a marrow and not as much flavour as the smaller varieties, but they will keep us in squash soup for the next few weeks. The flesh is a wonderful deep yellow. This one was over 5kg and there are another 5 outside – all bigger! 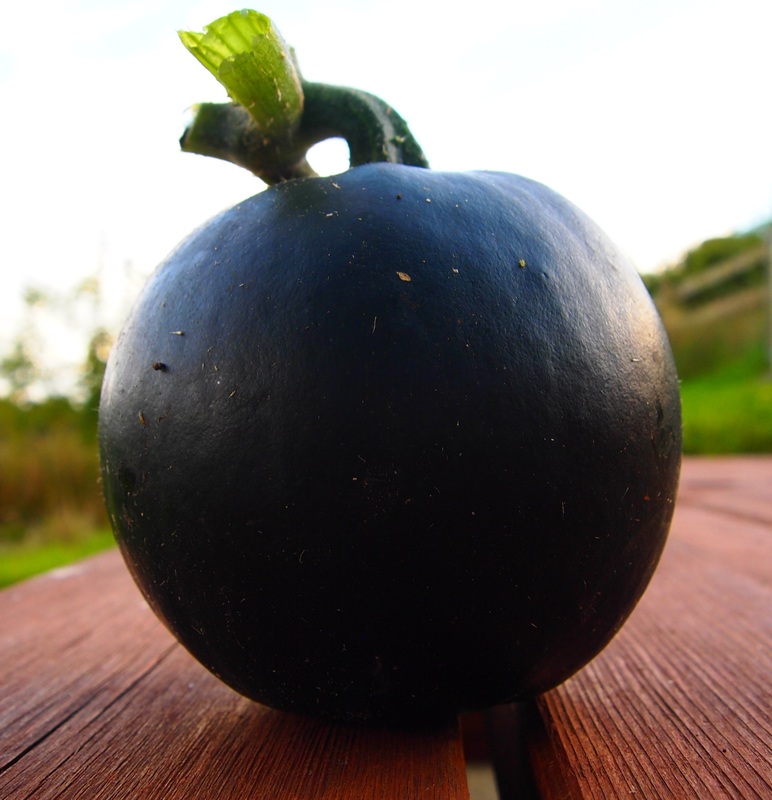 This entry was posted in Garden, vegetables and tagged garden, squash, vegetables on October 8, 2014 by Murtagh's Meadow.